The box call has been calling turkeys for decades, and will continue to do so for as long as there are box calls to be used, and turkeys to be called to. It's a friction style call that is very effective in the spring woods, and extremely user friendly. In fact, it's such an easy call to use, that someone that had never used one before should be able take it from its package, and be making turkey sounds within seconds. 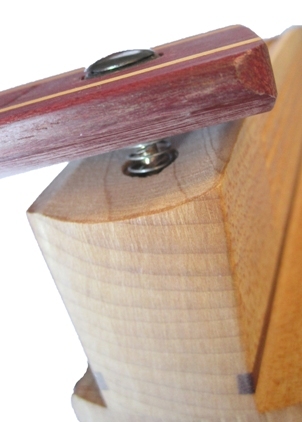 The paddle of a box call is a long piece of thin wood, slightly longer than the box, and slightly wider. To understand how a box call works, you must first understand the parts of the call and how they work together. The top part of the call is called the paddle, or the lid. For this article, we are going to say that the paddle is one piece of solid wood, although sometimes materials such slate or aluminum are affixed to it to generate different sounds. The paddle is connected on the box by the screw, but is not tightened down. It is left loose so it can swing freely back and forth, and most times you will find a spring of some sort holding the lid up to the head of the screw. The paddle is a long piece of thin wood, slightly longer than the box, and slightly wider. At one end there is a handle, or grip area to hold while using the call, while the other end is affixed to the box. The paddle is connected on the box by the screw, but is not tightened down. It is left loose so it can swing freely back and forth, and most times you will find a spring of some sort holding the lid up to the head of the screw. This allows the paddle to maintain the proper position, and keep it from slapping down on the end of the box while in use. The bottom of the call, or the box, can be made in a few different ways, but all with similar attributes. The similarities are, that the box is always longer lengthwise than width, and the sides that contact the paddle are always thinner than the ends. Some boxes are made of one piece of wood that has been cut to form, and hollowed out on the inside to create the sound chamber. Others are made of multiple pieces of wood that may be of the same type of wood, or may be different. Still there are others that have both wood, and manmade materials such as plastic. Looking at the box from a side view, you will notice that the sides are arched. Boxes made of multiple types of wood may be produced that way for a couple reasons. First, to create a desired sound by the mixing of hard woods with woods that are less dense. Secondly, for aesthetic reasons, which does not mean the call looks good and sounds bad, it may sound just as good as it looks. Ones made with manmade materials such as plastic have the benefit of consistency of sound. By having control of the plastic, that portion of the box will always be the same, leaving less variation in sound from box to box. Utilizing a mold also allows for less tooling, and offers the opportunity to add additional attributes to the call that may be possible were it made solely of wood. Looking at the paddle of the call from the end, you will notice that it is domed in shape, with the arch facing down. 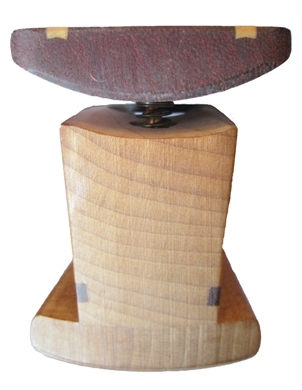 A box call works and produces a turkey sound by friction. It's the moving of the lid across one of the sides of the box that creates a vibration. It's this vibration that resonates through the box, emitting tonal qualities that go from high to low, mimicking the yelp of a hen turkey. How the box call creates this high to low sound is quite simple. If you look at the paddle of the call from the end, you will notice that it is domed in shape. The means that it is thicker in the middle than it is on the sides. This is very similar to the sides of the box. Looking at the box from a side view, you will notice that they are arched. They are taller in the middle section of the side, then they are at each end. What these two things mean, is that the thicker area of the paddle, and the shorter portions of the sides offer less vibration, creating a high pitch sound. While the thinner edge of the paddle and the higher area of the sides allow for more vibration, giving the sound a lower pitch. If you notice when a box call is opened, and in the ready position to make a call, the thick portion of the paddle is matched up with the short part of the side. As the paddle moves towards the closed position, the thin portion of the paddle lines up with the tall area on the side. This fluid motion from open to close is what replicates the high to low notes in a hen turkeys yelp. When the box call is opened, and in the ready position to make a call, the thick portion of the paddle is matched up with the short part of the side. Now this friction does not just happen because the lid is being dragged across the side of the box. It happens because the grain in the wood of the paddle, and the grain of the wood in the sides of the box are both aligned lengthwise with the call. When the two are run together, the grains are rubbing across each other creating the friction. This can be enhanced slightly with conditioning, or tuning of the call. Slight striations, or scratches can be etched into the paddle with sand paper. Make sure to go with the grain along the length of the paddle, and be sure not to alter the contour of the paddles itself. The marks made by the sandpaper may offer greater friction, and enhance the sound of the call. In conclusion, the box call is an easy running call that takes very little time master, and comes in plenty of variations to handle all types of hunting conditions. So if you haven't mastered the mouth call, or even if you have, the box call should be one call that you as a turkey hunter should have in your vest. It always has, and always will be a great call to use while turkey hunting. And as always, Hunt Hard, and Hunt Safe.